When it comes to raising capital to start a business we all know that the banks can be far from helpful, often refusing loans and overdrafts. Yet one thing most of us have to hand is our credit card or cards. These can be the difference between starting up or giving up the dream. Funding from other sources are also difficult to get, grants and bursaries are getting fewer and further between, families often don’t have the money to offer to other members and the low interest, instant approval credit card can be the answer to your problems, albeit temporarily. The advantages to applying for a credit card can often far outweigh the disadvantages when it comes to raising vital start-up capital for your fledgling business. Often, thanks to the accessibility of the Internet, credit card providers offer instant decisions on your application, even if you have a bad credit history. The main advantage of having the credit card means you can start trading without actually having the money in advance as you can borrow the funds from the credit card provider, dependant on your limit. This gives you access to the goods that you need to purchase in order to make your artwork and start selling. If you credit rating is fairly good you my be able to get two credit cards which you can use to keep track of different areas of the business, say one for rent and one for materials, thus separating the expenses. There is no denying that there are some serious disadvantages to taking out credit cards, despite the fact that they offer a lifeline to a fledgling business; the main one being the interest rate being far higher than on a bank loan. Although providers offer attractive interest rates to new customers these often only last for a certain period, after which the interest rate can rise dramatically. Also, it is easy to reach your credit limit meaning that before you know it you have no more funds available to spend. The amount to be paid back every month is very high compared to bank loan and can become horrific if left unchecked. 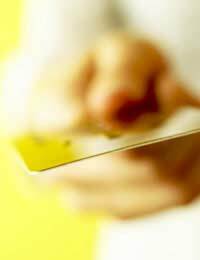 The main thing to remember when taking out your card is not to use the bank that holds your current account. This is because in your credit cards T&C's (terms and conditions) it is often written that should you fail to make your monthly payment the bank can take the funds from your current account without prior contact. By using a different card provider you can avoid this happening to you although you must make sure that you make the payments on time and in full if you want to use the card to keep making purchases, and if at all possible pay the balance in full as the end of every month to avoid interest charges completely. When you apply for any type of credit it is essential that you only borrow what you can afford to pay back, otherwise you may find that you lose your business before it gets going as creditors won't hesitate in taking you to court and applying for bankruptcy if you can't meet your payments. This could spell disaster for your business because as a bankrupt you are not allowed to run a business.